The Dachshund is a short-legged dog with an exceptionally elongated body. Just like the other members of the hound group, the Dachshund was bred to assist hunters by tracking or chasing wild game. Dachshunds are specialized in flushing badgers and other burrow-dwelling animals and will also scent and chase the animal. The miniature Dachshund was developed to hunt rabbits only. An interesting piece of Dachshund dog information is the fact that scars do not necessarily constitute a fault during dog shows. The Dachshund is a hunting dog and having scars from honorable wounds are therefore not viewed as an imperfection. In English, the Dachshund it is sometimes colloquially referred to as wiener dog, hot dog or sausage dog, but some owners find these terms derogatory. The word dachs means badger in German and hund means dog. In Germany the names Dackel and Teckel are however more commonly used for this breed than Dachshund. The amount of required Dachshund dog care depends somewhat on which type of Dachshund you chose: the smooth Dachshund, the Wirehaired Dachshund or the Longhaired Dachshund. Even if you get a Dachshund that does not require extensive amounts of grooming it is still a good idea to groom it regularly, especially when it’s a puppy. Gentle grooming sessions will make your dog comfortable with you handling it and this will make it much easier for you to cut its claws, care for it when it is sick and so on. A Dachshund dog care session can for instance include coat care, eye care, ear care, claw care and teeth care. During the shedding season you can bring your dog outside to give it a hand massage – this will help remove discarded hairs and prevent them from ending up on your furniture. Proper Dachshund dog care involves checking the eyes of the dog to make sure that they look clear and bright, and sniff the ears to detect any signs of dirt or infection. Other symptoms that should prompt veterinary contact are redness, swelling or sensitivity to touch. If the air passage inside the ear is blocked by hair, use a pair of scissors to remove the excess hair. Bathing should not be a normal part of your Dachshund dog care sessions, because too frequent baths will dry out its skin. How often you have to bath your Dachshund depends on coat type and how dirty it gets when playing around outdoors. It is important to pick a good shampoo that prevents dry skin. Dry bathing is another alternative, but keep in mind that strong dry bath products can irritate the skin. Dachshunds are very popular pets and the breed ranked 6th in the United States in the current AKC registration statistics. 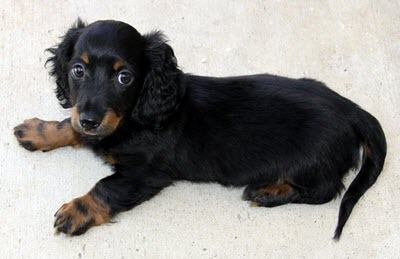 Before you get a Dachshund dog puppy you should however think it true carefully – will you be able to give it the care, training and affection that it needs for the next 15 years? One advantage with the Dachshund dog puppy is that it will not grow up to a huge dog and it is therefore popular not only among countryside hunters but among urban apartment dwellers as well. In almost 40 of the 50 major cities in the United States the Dachshund ranks among the top ten most popular breeds. If you want more detailed information about how to pick a healthy Dachshund dog puppy and care for it you can turn to your local Dachshund club; there are plenty of clubs in North America as well as in Europe and Japan. Originally bred for hunting purposes, the Dachshund is today trained for a wide range of purposes. Its minute size have prevented it from becoming a popular service dog, but it can still serve as a valuable companion and is commonly found in pet-friendly retirement and convalescence homes where it brings a smile to the faces of its human companions with its lively, happy-go-lucky personality. Dachshund dog training can also involve training your dog for sports, e.g. Dachshund racing, earthdog trials and scent tracking events. Before you engage in any Dachshund dog training for racing purposes, it is important to remember that Dachshunds are inclined to develop back problems. Dachshund racing should be a fun, playful activity – extensive training and competing can cause severe injury. During earthdog trials, Dachshunds enter tunnels with dead ends and obstacles in search of bait. The bait can be artificial or consists of a small live animal placed in a protective cage. According to the American Kennel Club, Dachshund dog breeding should aim to develop dogs that are clever, lively and courageous. Shyness is considered a serious fault; it is much better for a Dachshund to be rash than not courageous enough. All senses should be well developed and the Dachshund breed should retain its suitability for work above and as well as below ground. When it comes to general appearance, the American Kennel Club stipulates that Dachshund dog breeding should aim to create long-bodied and muscular Dachshunds with short legs and elastic, but not excessively wrinkled, skin. The dog should be strong and agile and breeding dogs that might look “cute” but are crippled, awkward or cramped is not encouraged. The head carriage should be courageous and confident and the facial expression intelligent and vigilant. There are three varieties of coat: smooth Dachshund, wirehaired Dachshund and longhaired Dachshund. When choosing between the various Dachshund dog breeders, it is important to pick a serious breeder that strives to use only healthy dogs as parents and provide both them and their puppies with good care. If you want to know more about how to stay clear of “puppy-mills” and other seedy Dachshund dog breeders, contact your local Dachshund club or kennel club. The Dachshund breed is known to have spinal problems, such as intervertebral disk disease, which is partly caused by their extremely elongated spinal column and peculiarly short rib cage. 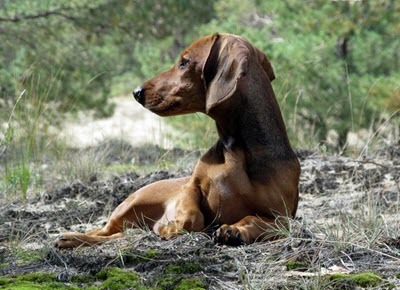 Both occurrence and severity of these spinal problems has been shown to be largely hereditary, and Dachshund dog breeders must therefore strive to eliminate unhealthy genes from the breed. If you get a so called “double dapple” Dachshund there is also an elevated risk for blindness and deafness and many Dachshund dog breeders are today refraining from promoting this colour variation. It is difficult to give any general guidelines regarding the Dachshund dog price since it varies considerably between different breeders and also between different parts of the world. The most important question to ask yourself is what you actually get for the offered Dachshund dog price. Has the breeder paid to have the puppy examined by a vet, vaccinated and de-wormed or will you be forced to pay for this yourself? Is the puppy well-fed and well socialized? Is the seller a reputable breeder that only uses healthy and well cared for parents with a good temperament or are you buying from a “puppy-mill”? A high quality Dachshund can live for 12-15 years, while an unhealthy dog might have to be put to sleep for its own best or require extensive veterinary care. Trying to save a few bucks on the Dachshund dog price can therefore end up costing you a lot; not only financially but emotionally as well. It should also be noted that a high Dachshund dog price is by no means a guarantee that you will get a healthy dog. If you need advice regarding how to select a healthy Dachshund and find reputable breeders, contact your local Dachshund club or Kennel Club.